Born in Matanzas, Cuba, Dr. Remberto Santos completed medical school at the Instituto de Ciencias Medicas in Havana. 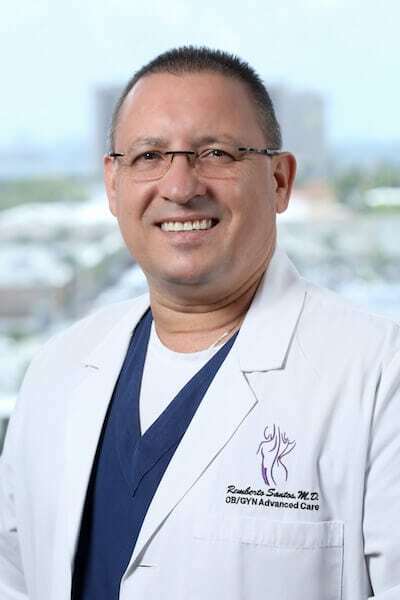 He performed an internship in obstetrics and gynecology at the University of Puerto Rico School of Medicine and completed his residency at the University of Miami Jackson Memorial Hospital in 2009. Dr. Santos is certified by the American Board of Obstetrics and Gynecology (ABOG). Dr. Santos specializes in the medical management of pelvic pain, abnormal uterine bleeding, and family-focused obstetrical care. His surgical interests include minimally invasive advanced laparoscopy and robotic surgery, cosmetic vaginal rejuvenation, and hysteroscopy sterilization, while his research interests include differences in diurnal blood pressure patterns in women with gestational hypertension with and without the development of proteinuria. Medicine has not only been a profession but a passion of Dr. Santos, and he is dedicated to providing the highest quality women’s health care available in the Miami and South Florida area.